Getaway by the sea,fishing, surfing,swimming and a happy safe place to stay. A 35 minute scenic drive from Whangarei CBD will bring you to Urquharts Bay. Once there go over the bridge and veer left and 300m up the hill on the right you will find our accomodation awaits you. You will pass a golf course, a great pub and local cafes. You can refuel your car / boat and get your bait at Parua Bay on your way to great fishing and diving. There is easy access to the harbour from Urquhart's Bay boat ramp. Our local wharf will entertain you and the kids with some hand fishing if you don't have a boat. Safe swimming beaches and surf are just on our doorstep. For those of you who like to walk, we have some of Northland's best coastal tracks. The property has ample parking for boats and vehicles. Near by there is a general store at Taurikura Bay and tennis courts. And further back at McLeod Bay is the Deck Cafe / takeaways and the Mania Club. We live near by and are always happy to help you out with information or anything you may require to make your stay an enjoyable one. If you require Linen we have a small fee of $30.00 per stay . We would supply bath towels and bath mat, tea towels and sheets . Bring your own beach towels please.There are pillows, duvets and blankets supplied. We also have electric blankets on each bed. There is a rubbish transfer station in Parua Bay should you miss the rubbish collection from the gate. Please take your rubbish there. Crack open a cold drink and kick back and relax at Getaway by the sea. We grew up in Whangarei area and have always had a love with the beach. We love the lifestyle as we have a boat and enjoy going fishing regularly . We play golf and walk the many tracks in our area. 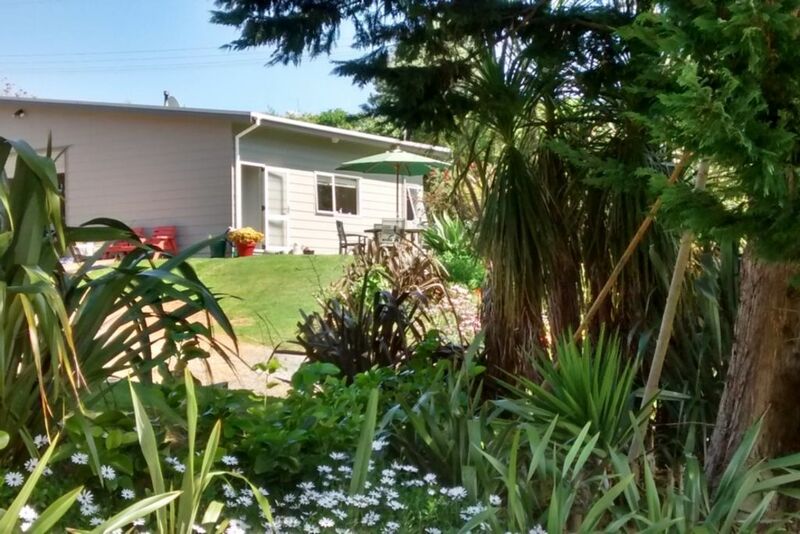 We are also a short trip by car to the our city centre Whangarei ( about 35 minutes) We are also retired and have recently purchased a modern caravan so we will see more of our country New Zealand . We enjoy meeting people from all walks of life and would very much like to meet you. We choose to live at this property because of its closeness to excellent fishing grounds and easy to launch your boat . Choice of having safe swimming and also to be able to go to the surf beach and not to far to the main township of Whangarei. We have a large property to enable people plenty of room for boats . We are 2.5 Kms from the famous Ocean Beach . With its powerful surf and dramatic sand dunes. Popular for surfing and body boarding or just relaxing. There are walks north and south of the beach. Our beach property has mountain views a rural outlook. But is only a 300 metre walk down to the beach front. An easy walk down to the beach from our bach about 300 metre. Blankets and Pillows are on all beds. Bed sheets and towels are available upon request for an extra one off fee of $30 per stay. It's a great location and very handy to different attractions. Barbara and Mark, the owners are very nice and warm. The only thing we were disappointed in is the 'bang-bang' noise caused by wind blowing on the garage door. We could't sleep at all during the whole night. We already informed Barbara and hope it can be improved. If you want an awesome base to explore the beautiful Whangarei Heads this is all you need.Barb & Mark are great hosts. Thank you for great guest. Absolutely perfect tenants. We appreciated you leave the property in such perfect condition so clean. We welcome you back and recommend you to other bach owners as guests.Pleased you enjoyed your stay in Urquharts Bay Whangarei Heads. If you don’t mind an open plan sleeping arrangement then this bach has everything you need. Would work well for a family or group of friends who want to enjoy the beaches nearby. We are pleased you enjoyed your stay with us. We strive to make this a home away from home. You were the perfect tenants and very welcome to return again. Mark and Barb are lovely hosts - very accommodating and made us feel very welcome. Thank you for leaving the place spotless . See you again maybe one day . Mike you left our beach house in perfect condition. Absolutely spotless . Great communication. We would recommend you to other bach owners as a tenant.Pitty we couldn't of got you some fish while you were staying here.Next time. Great spot to stay! Very warm. We have many easy walking tracks in our area. Must do is the 20 minute walk directly over farmland to Smugglers Cove. The majestic rocky outcrop of Mount Manaia dominates the skyline, towering some 460 metres above the Whangarei Harbour. A vigorous one hour climb up through beautiful native bush takes you to the summit for breathtaking 360 degree views . Take your camera . This walk is about 15 minutes from our beach house. You can drive by car and park in the car park there. Highly recommend for everyone . You must go to Ocean Beach great surf and beautiful views of the pacific. Busby Head & Bream Head Track. From Urquharts Bay car park, its an easy two hour loop walk, takes you around Busby Head to Smugglers Cove, a secluded white sandy beach. The walk passes a gun emplacement at Home Point, built during World War II as a defence against possible invasion.